High-tech metals are used in rapidly growing advanced-technology industries that are now being boosted by consumer demand for a high-tech, connected and environmentally sustainable future. The variety of products using high-tech metals are almost endless: from tiny mobile phone parts through to medical applications such as hip replacements and pace makers; from storing solar energy at the home to electric vehicle components and parts for huge wind turbines; even flying above us in parts for aircraft and satellites – high-tech metals play an important role in modern life. 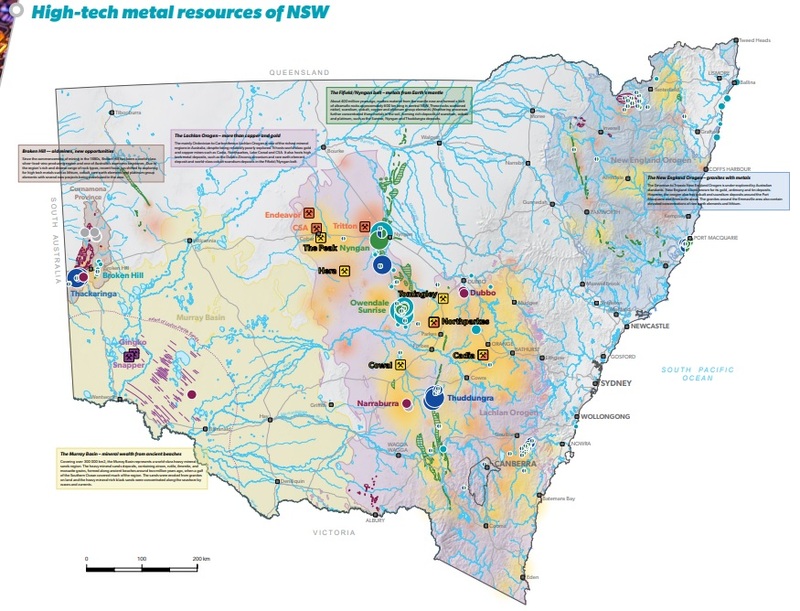 NSW is rich in high-tech metals, offering exciting opportunities. cobalt, lithium, titanium and zirconium. The map also explains the sources and uses of high-tech metals, contains important project summaries, and provides charts of current world production and reserves. A detailed glossary and reference list are also included. Please specify if you require a folded or flat copy. M.J. Armstrong, P.J. Carter, M.J. Drummond, G.D. Fleming, D.B. Forster & L.M. Talbot (compilers) 2018. High-tech metal resources of New South Wales. Geological Survey of New South Wales, Maitland. This work (with the exception of the Government Coat of Arms, any government owned trade-mark, logo or brand and third party content) is licensed by the NSW Department of Planning and Environment under a Creative Commons Attribution 4.0 International License. Attribution must be given in this form: © State of New South Wales through NSW Department of Planning and Environment 2018. The information contained in this publication is based on knowledge and understanding at the time of compilation (2018). However, because of advances in knowledge, users are reminded of the need to ensure that information upon which they rely is up to date. NSW Department of Planning and Environment takes no responsibility for the accuracy, currency, reliability and correctness of any information in the map (including, without limitation, any of the information provided by third parties) nor for the accuracy, currency, reliability and correctness of links or references to information sources (including Internet sites) with regard to the map. While all reasonable care has been taken in the compilation, to the extent permitted by law, NSW Department of Planning and Environment and the State of New South Wales and its employees and agents exclude all liability for the accuracy or completeness of the information, or for any injury, loss, or damage whatsoever (including without limitation liability for negligence and consequential losses) suffered by any person acting, or purporting to act in reliance upon anything contained herein.